If you struggle with rosacea – an inflammatory skin condition that causes red, warm flushing of the skin – you have probably been told to avoid drinking hot beverages like coffee, tea, and hot chocolate. However, a December 2018 paper found surprising evidence that the caffeine found in coffee may help to reduce the risk of rosacea in women. Researchers analyzed data provided by a cohort of 82,737 women in the in the Nurses’ Health Study II (NHS II), formed in 1989 and followed-up biennially between 1991 and 2005. Data on coffee, tea, soda, and chocolate intake were collected every four years. During this period, there were just under 5,000 rosacea incidences among the participants. After adjusting for other factors, researchers found that increased caffeine intake from coffee lowered the risk of rosacea among the group. Women who drank four or more cups of coffee per day were 23% less likely to develop rosacea. Interestingly enough, there was no association between decaffeinated coffee intake and a lowered risk of rosacea, nor did other sources of caffeine like tea, soda, and chocolate affect rosacea risk. While we are still unsure of the mechanisms behind these findings, researchers believe that consuming caffeinated coffee may help to decrease the risk of rosacea. Still, more research is needed to provide more detailed and accurate patient recommendations. How Does Caffeine Help Rosacea? This was an observational study, so more research is needed to determine cause and effect between caffeine consumption and rosacea risk. However, we do know that caffeine constricts blood vessels and decreases vasodilation, which is likely part of the reason why caffeinated coffee decreased the risk of rosacea among study participants. 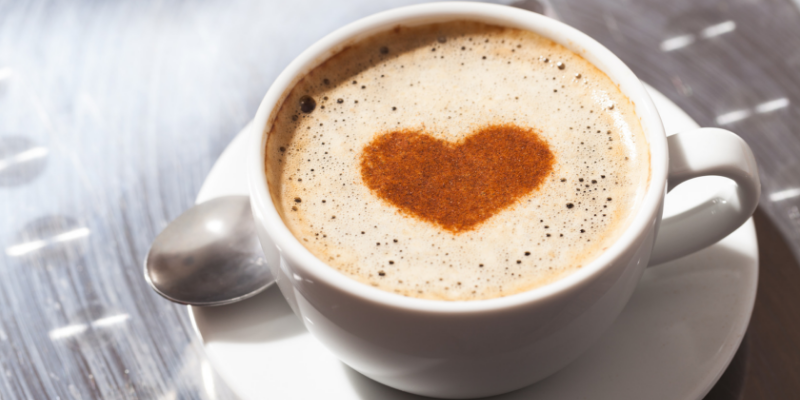 Researchers are still unsure as to why other sources of caffeine did not affect rosacea risk. Why Are Rosacea Patients Told Not to Drink Coffee? According to a survey performed by the National Rosacea Society, 36% of the participants found that hot beverages triggered a symptom flare-up. Therefore, it is often recommended that rosacea patients try to avoid very warm beverages to help minimize flares. However, not everyone will react to every trigger in the same way, so some people may not notice a difference when drinking hot beverages. If hot drinks do tend to cause a symptom flare for you, try drinking iced caffeinated coffee instead. Keep in mind that more studies are needed to say for sure if drinking coffee could calm rosacea, but the latest evidence is promising. What Other Foods Affect Rosacea? Diet can play a significant role in the management of rosacea symptoms. Since inflammation is the root cause of rosacea flares, eating a “rosacea diet” full of anti-inflammatory foods like salmon, walnuts, flax seeds, and kidney beans can help to manage your symptoms. On the other hand, try to avoid eating foods that can trigger inflammation and redness, such as spicy foods, alcohol, vinegar, and high-sugar foods. We are learning more and more about rosacea and potential treatments for it. Researchers involved in this observational study say that further studies are needed to explore their findings in more detail. Stay tuned for more updates on rosacea treatment, management, and prevention as they come out. Follow Baumann Cosmetic on Facebook, Instagram, and YouTube to stay in the know about the latest rosacea news and research. You’ll also find skin care tips and tricks for managing rosacea from Dr. Leslie Baumann.